It is believed that buffalo(bison) hunting began approximately 11,000 years ago, and it lasted until the end of the 19th century. At the time of the first European contact, 60 million American bison populated the 750,000 square mile Great Plains. Then, when buffalo hide prices rose to three dollars apiece, buffalo were killed by the millions. At the time, the average person worked a week to make that kind of money. It was believed by many, including those in the military, that the extermination of the buffalo would put an end to the Native American once and for all. 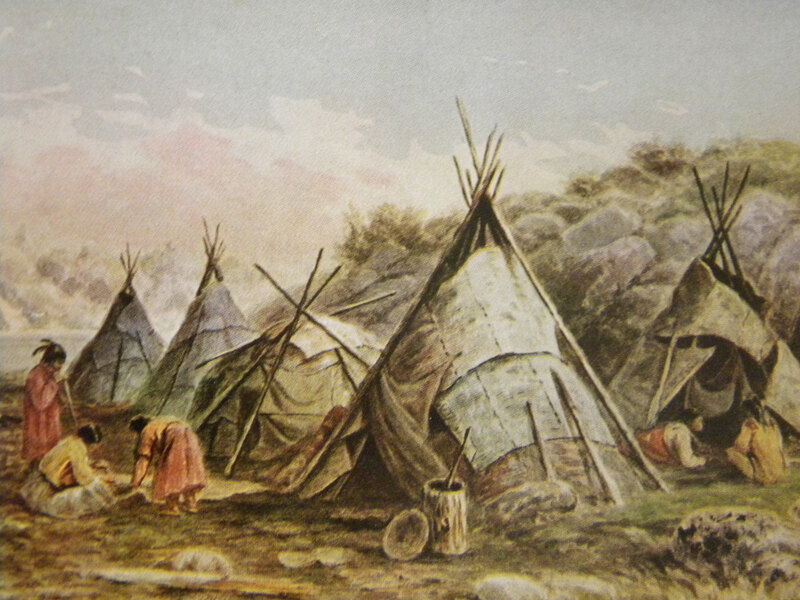 After all, Plains Indians used buffalo for food, clothing, and shelter. Hunting buffalo was essential for their survival. By the late 1880's only about 1,000 still survived. One buffalo could feed an average sized tribe for one day. At times, the Native Americans killed as many as 300 buffalo during a hunt. This forced them to process the meat into pemmican. Pemmican was made by hanging strips of meat until they dried. It was then pulverized with a mortar and mixed with buffalo fat, sometimes berries were added for flavor. The pemmican was then placed in an air tight buffalo container. In this manner it could keep for many months. The most desired part of the buffalo was the tongue. The tongue was usually awarded to the medicine man. Buffalo skins were used for a vast variety of purposes. They used the tanned skins with the hair removed to cover their lodges, make moccasins, robes, and blankets. Native Americans kept the hair intact when they wanted to keep the wearer warm in the winter. They used the thick hide around the neck to make shields that were capable of stopping an arrow. They used the horn to make ladles, spoons, and dishes. Shoulder blades, once lashed to wooden handles, became axes and hoes. In addition, they made rope, knife sheaths, gloves, bow cases, glue, and suitcases from buffalo. One of the most prolific ways to kill buffalo ever utilized was the chase the buffalo over a 100 foot cliff. Native Americans called these buffalo jumps. Archaeologists tell us that the Native Americans developed over 100 buffalo jumps throughout North America. Probably, the most famous of these is the Head-Smash-In Buffalo Jump in Alberta, Canada. This jump was first used around 6,500 BC., and more than 100,000 buffalo died at this site. It was a fairly simple concept. Buffalo runners were sent out in search of a herd. Disguised in buffalo hides and wolf robes the runners slowly lured the buffalo towards a cliff. Sometimes it would take several days to position the buffalo for the kill. Over hundreds of years drive lanes, which are basically long lines of stone piles, were used to steer the stampeding buffalo over the cliff. The drive lanes went for miles before eventually forming a V that pointed directly over the cliff. As the buffalo raced at 35 miles per hour down the drive lanes, the warriors race behind them screaming and yelling in an attempt to further scare the beasts. The 100 foot fall killed most of the buffalo outright. However, the few that survived were killed immediately because the Plains Indians believed that any survivors would warn the other herds, and the buffalo would vanish.